Fig. 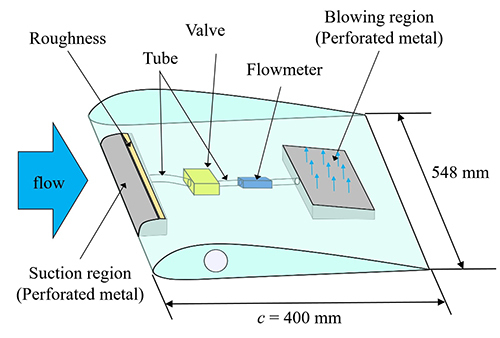 1: Schematic of passive blowing. Fig. 2: Clark-Y airfoil model. (a) α = 0°, Rec = 1.55 × 106; (b) α = 6°, Rec = 1.55 × 106. (a) α = 0°, Rec= 1.55 × 106; (b) α = 6°, Rec = 1.55×106. Fig. 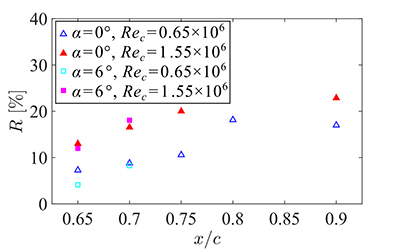 5: Local friction drag reduction rate R.
(2) 江藤薫子，近藤佑亮，深潟康二，徳川直子，「一様吹出し制御による翼面摩擦抵抗低減の実験的定量評価」，日本機械学会流体工学部門ニューズレター「流れ」，2019年3月号，Article No. 3 (2019). 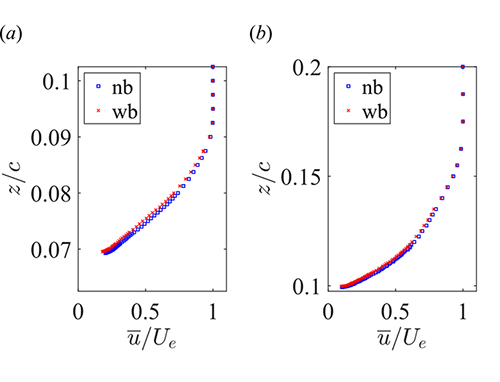 (3) Park, J. and Choi, H., “Effects of uniform blowing or suction from a spanwise slot on a turbulent boundary layer flow, Physics of Fluids,” Vol. 11, No. 10, pp. 3095-3105 (1999). (4) Kametani, Y. and Fukagata, K., “Direct numerical simulation of spatially developing turbulent boundary layers with uniform blowing or suction,” Journal of Fluid Mechanics, Vol. 681, pp. 154-172 (2011). (5) Kondo, Y. and Fukagata, K., “Friction drag reduction of a spatially developing boundary layer with pressure gradient by uniform blowing and suction,” 11th European Fluid Mechanics Conference, Seville, Spain, Sept. 12-16, 2016 (2016). (6) Liu, P. Q., Duan, H. S., Chen, J. Z. and He, Y. W., “Numerical study of suction-blowing flow control technology for an airfoil,” Journal of Aircraft, Vol. 47, No. 1, pp. 229-239 (2010). 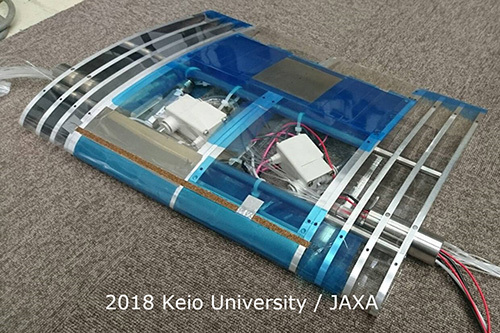 (7) Eto, K., Kondo, Y., Fukagata, K. and Tokugawa, N., “Friction drag reduction on a Clark-Y airfoil using uniform blowing,” 2018 Flow Control Conference, AIAA AVIATION Forum, Atlanta, June 25-29, 2018, AIAA Paper 2018-3374 (2018). (8) 国立開発研究法人宇宙航空研究開発機構（徳川 直子），学校法人慶應義塾（深潟 康二，近藤 佑亮，江藤 薫子，廣川 詩歩），「気流制御装置，航空機および気流制御方法」，特願2018-029486. (9) White, F. M., Fluid Mechanics Seventh Edition in SI Units, McGraw-Hill (2011), pp. 377-379. (10) Nickels, T. B., “Inner scaling for wall-bounded flows subject to large pressure gradients,” Journal of Fluid Mechanics, Vol. 521, pp. 217-239 (2004). (11) Vigdorovich, I., “A law of the wall for turbulent boundary layers with suction: Stevenson's formula revisited,” Physics of Fluids, Vol. 28, 085102 (2016).